This one is posted before and I mentioned it on my first post in this topic. Here is Bruce Osborne playing a Baldwin with Prismatone on Dolly Parton's Jolene during the Porter Wagoner Show in 1974. Here is Glen Campbell playing Classical Gas on a Ovation Country Artist with Prismatone in 1977 with the Royal Philharmonic Orchestra. There is also a video of Glen C and Carl Jackson playing the original Country Boy as well. Carl is playing one of Glen's initialed Ovation 1624 guitars and he is rippin' it up big time. I would post it to Youtube if I could figure out how to convert the dvd files to flv. that YT uses. Here´s another one of Glen and Carl, Duelling Banjos recorded in 1973. I remember seeing this from a TV show in London back then, Glen commenting that is wasn´t bad for such a young boy, and asked us to notice that "not once did his fingers leave his hands". Logs of good humour as well as excellent musicianship. Well, I managed to upload the video I mentioned above. You can really hear the Prismatone sound in this one and it is certainly the best representation of the Ovation/Prismatone combination that I know of. Carl Jackson's amazing playing doesn't hurt the sound any, either! Thanks a lot for uploading that video Wayne. Carl is quite a picker indeed... This is definitely a good showcase of how the Ovation sounds with the Prismatone. Here is Dolly playing the song Gypsy, Joe and Me on a Baldwin. It's probably Bruce Osborne's guitar, cause he played it on Jolene during the same broadcast of the Porter Wagoner Show in 1974. 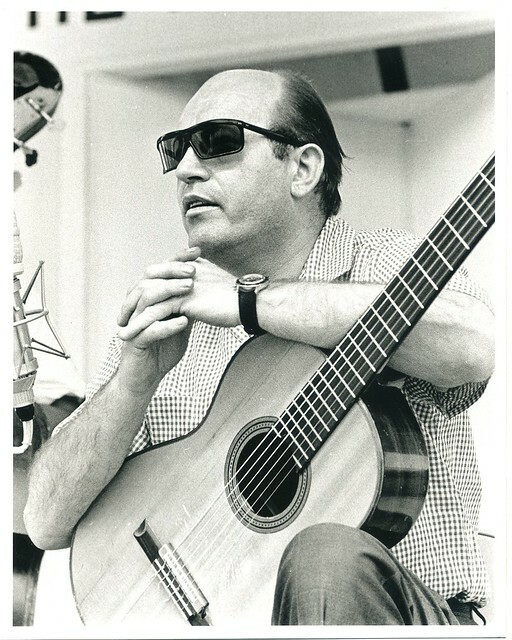 Here is the only evidence I could find of Charlie Byrd playing a Prismatone fitted guitar. It isn't a Baldwin, but it has a Baldwin pickup. I think he removed the pickup from the promotional guitar (800C) he received from the Baldwin Co. and installed it on his regular guitar. This was probably a few years before Baldwin made the 801CP. Willie Nelson was also one of those who received a Baldwin 800C. The pickup from that one got on his "Trigger". Last edited by Hendrik on Wed May 15, 2013 8:40 am, edited 1 time in total. And here is Dolly Parton on the Porter Wagoner Show. This is probably from 1974 were she performed Gypsy, Joe and Me unplugged on a Baldwin 801CP (probably Bruce Osborne's). ...didn't have her nails done. Must have played a little more guitar than usual. She "did" Dolly Parton very well. I don't think people realize the skill it took to do that act and rise from just being "another girl singer"